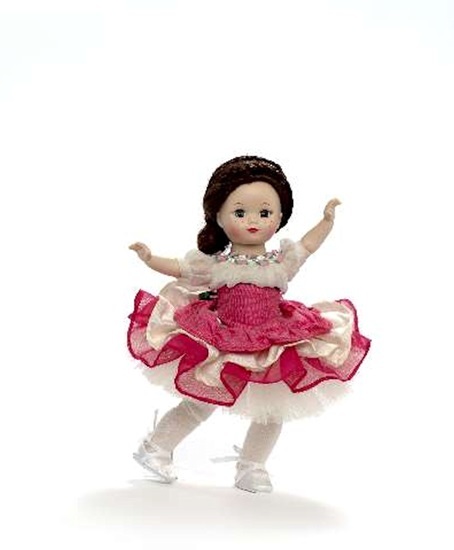 We are pleased to share "La Jolie Fleur", an 8-inch, fully articulated Maggie ballerina doll. New in 2013, this endearing little lady has green eyes and brunette hair that is pulled back in a low bun and wrapped in braids. Her tutu consists of and ivory and magenta taffeta bodice with a full skirt that is comprised of layers of ruffled ivory and magenta taffeta over layers of white silk organdy. Short puffed sleeves on the bodice, white tights and toe shoes accented with touches of green, completes this classical look. She is suitable for ages 14 and up.